Hello world! 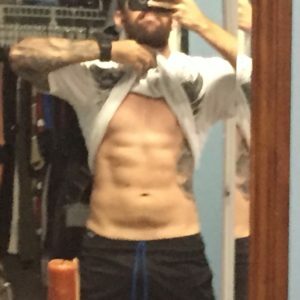 I’m back today with a short update in regards to my progress using Lee Lebrada’s Lean program. At this point I am kicking myself for not doing the one thing I always do before starting any fitness program… taking the before pictures. Except for one shirtless picture I took the day before I started the program, I have no other pictures taken. So…..! What’s new? Well, after losing 1 lb during week one, I gained back that one pound after my third week. I adjusted my macros to 185 lbs once I had lost the pound, yet, I gained it back. Amazingly, it seems that I have gain muscle mass and dropped body fat based on the physical changes, weight and clothes. Again, I can’t really show anything more than one picture I took on day 0 there have been changes without doubt. One thing is certain, using the proper lightning angle to help create better shadows of my muscles, my abs when flexed, are looking ridiculously good, and again, this has just been with 3 weeks of training. Before I show the pictures, I want to make sure I mention I have done a couple of things different from what instructed in the program. â€¢ First one is, although I have followed the total caloric intake suggested, and as close as possible the macro ratio, in many occasions I have altered the macro ratios, sometimes eating more fat than suggested and less carbs at some point, but always balancing the macros so at the end of the day I still have eaten the right amount of macros. â€¢Second, I have more often than I’d like to admit, ignored the 3 big meals and 2 small meals suggestion. At times I only have 3 meals and one snack, or 2 meals and 3 snacks. Again, always staying within the daily caloric intake. â€¢ Third, for the cardio days, I’ve been implementing Lyle McDonald’s Stubborn Fat Protocol, only twice a week. â€¢ Forth and last, I have added extra sets and in rare occasions extra exercises to some of my workouts when I have the energy and I have felt I can exercises more. One I always do is the abs crunches. I can’t just do 3 sets of 12 reps and be satisfied. In this case I do 5 sets of 15 reps of kneeling cable crunches with the maximum weight the machine allows me, and this is because my abs can handle it since before I started this plan. With that said, here are the photo comparison of day 0 and day 24, and below the picture I took flexing with the light coming from above.